What kind of flower is that?? Just a tulip, casting a shadow on pink granite! Carl surprised me this week by taking vacation for a half day on Wednesday and all day today, Thursday. Like I've said before, when he's home, we get a whole lot more work done. We decided to focus on the east side of the quarry berm exclusively in an effort to get things done. A little bit of history again; before the quarry was dug, the area was planted with rows of blue spruce trees in a circular fashion. When we decided to put the quarry in, we traded the spruce trees which were in the way of excavation in exchange for digging the hole with Charlie. We left the trees directly around the quarry stand, but as time went on, those trees were either moved or sawed down or pulled out. The 2006 picture above shows our friend the tree spade owner digging a tree on the east side of the quarry. This is the area we are working on right now. The spruce were outgrowing their space and starting to encroach on the quarry itself. We had one of the three trees moved out to a new home but the other two we ended up cutting down because they were too big to move. After we had those three trees removed, we had another one of those, 'oh no' moments because we didn't realize how the trees framed the quarry and made it more attractive until after they were gone. 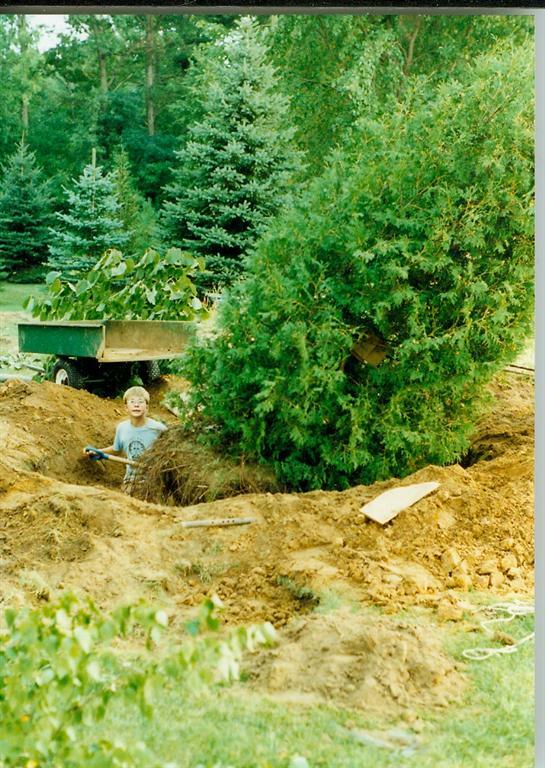 This is Joel in 1996, 10 years old, down in the trenches again hand digging a cedar. How's that old saying go...'they were born with a silver spoon in their mouth'? It appears Joel was born with a shovel in his hand; no one has moved more dirt in this yard by hand than Joel! After the three spruce trees were removed, we realized how much we needed something else in the area they occupied. We had some small limestone left over from the quarry construction, so Carl and I set out building a small berm. After we finished it, we weren't very satisfied; it was an inadequate little pipsqueak of a 'hill' and the rocks we used were too small to blend in with the bigger stone the quarry was built from. Below is a picture of the beginning construction taken in August, 2008. Now we move forward to April 2010 and the east quarry berm, built a bit higher with the new bigger stone we got in last fall. I happened to remember there was a big rock we had put in place before we hauled the dirt in and buried it. So, before we went any further on Monday night, we had to dig the rock out. Hard to see in the above photo, but lurking under the soil. We managed to fish it out of the pile of dirt. This is how the garden looked on Wednesday afternoon. And here's how it looked Thursday night just before sunset. We planted two trees already! One is a 'Picea Glauca Fastigiate'? well, that's what the tag says, but I'm thinking the tag isn't right since I've never seen a blue spruce so green; looks more like a Picea Abies to me, but doesn't seem to need to be staked. We'll find out when the new top growth appears. We bought this tree from Menard's for $29. Here's the second tree, a Pinus Koraeinsis 'Winton' which we bought in a 4" pot several years ago at only 5" tall. It has grown to about 3' now and we had to move it as where it was growing on the north quarry hill was becoming too crowded. I love the texture and form of this tree and hope it survives the move. This morning we decided to move several trees out to the 'Adrian Walk' too. It was so windy out all day today with gusts over 30mph, so probably not the best weather to be transplanting trees. I don't know how many times Carl's hat blew off (he doesn't have a nifty chin strap like mine, ha) and we both have enough sand in our eyes to last us a few days. Before we could move the trees, we had to pull out two more white pines from the back eight. I dislike doing this intensely, but the trees are so close together they are ruining each other. Soon the only greenery on the trees would be on the tops as pine dislikes shade. We pulled these two trees out just before noon today. Two more 25' tall white pine on the brush pile. Hard to tell from this picture, but the pines we pulled out are in the middle of the shot, right behind the ball-shaped yellow cedar shrub. We planted an Austrian pine 'Oregon Green' and a Colorado blue spruce, 'Iseli Fastigiata' in the same area. We're trying to incorporate some textural interest for the Adrian Walk. In this picture the pines are still standing. The destruction didn't end there, though...we still have three Ironwood trees to plant from D&D Nursery that we bought two weeks ago and the Amelanchier 'Autumn Brilliance' aka as serviceberry to plant. We've had an Euonymus alata, commonly called 'Burning Bush' planted in the small kidney-shaped island bed near the quarry for years. This year it was looking very tired and tatty and hadn't properly leafed out though all the other ones I have in the yard are in full greenery. So, we decided the burning bush could vamoose and the serviceberry should take it's place. And, in the burning bush's place--the new Serviceberry clump. I have high hopes for this tree, the ones I've seen in other people's gardens are very nice. I still have to find homes for the Ironwoods yet. We were home alone most of the day. Joel came home from work and had to wind the clock at church and then headed back to Green Bay to help his good friend. Dave was home around 3PM and changed the oil in his car, but then had a slight mishap on his way out of the driveway. He's not used to parking in Joel's stall which is close to the greenhouse, so when he backed out, his car hit the greenhouse and moved it over a good three feet. Thank goodness the flats weren't tipped over, and with Dave's help, we got everything set to rights again in there, though I will admit, I was pretty steamed about it at first. Today was a hard day's work, and I was more tired than I realized which is probably why I over-reacted. All's well now. I'm not sure why, but the annuals seem to be very slow-growing this year. Today was Dale's 27th birthday, so I made a cake this afternoon when we came in for lunch and also a beef roast in the crockpot because Ann was going to join us for supper. I wasn't sure if Dale could make it for supper or not, but he did, around 7PM. (Poor guy, he ended up eating twice, lol.) Before he left, Richard and Emily stopped in for a quick visit too. It was nice to see them! Everyone went home by 11PM. This morning I took a few more photos of some of the flowers which are blooming yet. I thought I'd end this post with their pretty faces! Not sure of the cultivar, but these flowers are very small, around an inch across with multiple branching that reminds me of an orchid. I have the small daffodils in yellow and white. Grows late, and tomorrow (ok, today!) is another day. The forecast calls for rain, so we will be tearing out the carpeting in the living room tomorrow afternoon. Wish us luck!! Our heating contractor told us that one of the first things people ask about when they are considering geothermal is, "Will the installation make a mess of my yard?" September 23, 2009 was a Wednesday and both Carl and Joel took vacation to be home for the Big Event. Bright and early in the morning Charlie arrived at right around the same time as the heating contractor's crew. We were ready to go. We had Joel bring the old dump trailer hooked to the 574 to haul the stumps out to the brush pile. Charlie shook his head (and I didn't think it would work either) when he gently dropped the great big stumps in the old trailer. What keeps that trailer from falling apart is beyond any of us. After the stumps were out, Charlie stripped the black dirt from the lawn and piled it up for backfill. The next step was to dig the hole for the manifold (the lines coming into the house). Then the first of the four trenches were dug for the geothermal coils, 6' deep, 5' wide, 80' long. Joel, in the trenches, like usual; over the years, he's been our right-hand man. Joel and Carl look on as the contractors install the loops in the trench. Starting the fourth trench; Joel and my mother, Lucille and Carl's mom, Rosemary look on. The dirt piles are growing! Joel removed any sharp rocks while the coils were being backfilled. After the trenches were buried, we all took a break. Carl asked Charlie to make a mound of dirt coming off the house as high as he could. This would be the start of, you guessed it, the Elephant Burial Mound--(hereafter referred to as the EBM or, ok, the West Berm). To think we used to mow this lawn!! Break was over, and Carl had to go back down in the basement and help the contractors with some wiring. Charlie continued working on building the mound and spreading the black dirt out again and I was here, there and everywhere. About the only person we can count on to stay with a job to the end is Joel. Just before he left, Charlie asked if there was anything else we wanted done while he was there. 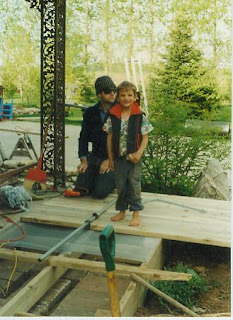 That's when I thought of the big granite rock from Cody and decided to ask Charlie to place it for us. I didn't know where to put the rock until that day, when I decided it would look nice in the little flower bed on the lawn. Charlie wanted to know if I was sure about this, because it would destroy the bed if he had to move it. After we tried moving the boulder for a few hours a couple days before this, we were amazed how easy the machine could lift it. Carl isn't shaking his fist here, he's just telling Charlie the placement is perfect! Then we asked if he could place the biggest limestone rock on the very top of the pile for us and he obliged while Mom looked on. So, around 3PM, Charlie loaded up the excavator and headed off to his next job. His part of our chaos was over; ours was just beginning. The work on the West Berm was our next goal. Stay tuned. Now we fast forward one more time to September of 2009 and the demise of the last of the three Colorado Blue Spruce trees originally planted by the house. Over the years we have changed the gardens so many times, that, frankly, I've lost count. Above is a picture of David, age 4, helping Carl build the front porch extension in 1995. After the porch was installed, we changed the front of the house again. The west side of the house, for lack of a better description, was very shady once the elms, ash and spruce trees grew, which enabled us to plant our then expanding hosta collection into new territory. We collected flat limestone from any place we could get it for low walls to add height and a boundary in the gardens. One of our best supplies of free flat rock was the local yardwaste facility where people from town brought their grass clippings and tree branches, rocks, discarded shrubs and plants, that is, before the place was closed down due to illegal dumping of things like refrigerators, TV's and tires. This was a shame, because all people had to do was follow the rules, but there's always a few who won't. We used to round the boys up when they were young and head to town every night to see what was new at the dump. Many times we took all the back roads home because the little car trailer had more than a ton of rocks on it causing the tires to rub on the deck and we had to go slowly for fear of a flat. Never let it be said our kids weren't treated to high quality family activities. As the years went by, the gardens evolved, and we had to make some hard decisions. For some time, we had been unhappy with the flower bed on the west side of the house. It never seemed to 'work' for lack of a better word. We had tried planting six crab apples in a staggered row to form an 'apple walk' which was beautiful in the spring when they bloomed, but the other trees were taking over and it was all a bit of a mess. It was also not in the traffic flow for garden tours and was often overlooked by visitors, which didn't bother me as I often hadn't the time to properly maintain the area. All in all, it was a weeding nightmare once the elms died and the garden became sunny again, which also stressed the sun-burned hostas. I removed hundreds of hosta from the bed and replaced them with daylilies, but even the daylilies failed to do much for the area, especially when they were not in bloom, which is 3/4 of the summer. In this picture you can barely make out the little apple trees behind the tufa wall. Here is a longer range photo, showing the apple trees in bloom along the tufa wall. Years later, the trees grew quite well, but it was crowded. Anyway, back to Sept. '09. We had to replace our 31 yr old oil furnace and decided to go with a geothermal heat pump. The biggest problem with installing geothermal is the vast amount of space the system needs for installation underground. Our house is relatively small; being just over 1500 sq. ft, so a 3 ton system would probably have been adequate, but because we were hoping to build an addition on at some point, we upgraded to a 4 ton system. 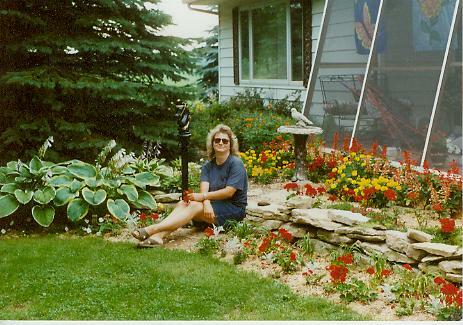 This meant we had four 80' trenches dug, 5' wide, 6' deep and the only area really practicable was the hosta bed on the west side of the house. By September of 2009 all that was left in this garden were low stone walls (around ten tons of limestone) and a 3' tall wall of natural tufa rock about 100' long. (I will write more about the tufa rock and how we came to have so much of it at a later date) and h.Albo Marginata by the dozens along with H. Pacific Blue Edger, H. August Moon, H. Royal Standard, and H. lancifolia, an ash tree (which would probably have succumbed to Emerald Ash Borer) and the lone, surviving blue spruce from the original three we started with. The decision to completely wipe this area out was not lightly made. We knew how much work was involved with moving everything from rocks to plants. But, change is sometimes necessary and often a good thing. Since we weren't happy with this area of the garden, we decided to wipe the slate clean and have the geothermal installation put there. Out came all of the remaining hostas, daylilies, columbines, heucheras, etc. I called friends and friends of friends who came to take large amounts of hostas home which was great, and saved us the bother of replanting all those plants. We took the tufa wall down and rebuilt it on the east side of the driveway, which in turn, replaced a split- rail fence. The split-rail fence was installed in front of the house just before Christmas; I know, it sounds like musical chairs, doesn't it? Out of the blue, on a Sunday afternoon in August, Joel's friend, Cody, stopped in and asked us if we would like a big rock. Well, of course we would, never turned one down yet. His father was working on a jobsite near Greenville, and this was one of the rocks which turned up as a result of excavating for a church. It is granite, and BIG! We had it put in front of the house because we knew we were going to be changing things around. In this picture, Dave and I are examining the new rock (and wondering how we're going to move it and where we'll put it). So, this is how the garden looked in August 2009 before we started to rip things up one more time. Here we go one more time: Joel is up in the tree and Carl is observing and loading limbs as they come down. On one of the limbs, Joel spotted a little tree toad. We moved him (or her) to a safer spot. Notice how the interior of the limbs are almost devoid of needles, which is common on older blue spruce. The house is visible from the road now! Hmmm....oh, well, all you can do is load up the wood and move on. We had a beautiful stand of hundreds of Lycoris Squamigera or Surprise Lilies in the area and yup, they had to be dug up and moved, too. but, well........this was a much bigger rock than our 52 hp tractor could handle. So then, Carl hooked a hand winch to the blue spruce tree stump and tried winching the rock closer to the house which worked, he managed to drag the rock about three feet, but fine-tuning the placement was not going to be easy and we really didn't know what we were going to yet anyway. We decided to leave the rock sit where it was since it was out of the way of the geothermal installation. About a week before Dig Day, Charlie, our Digger Extraordinaire, stopped in to check on the upcoming geothermal excavation job. He said he was placing rock for a large estate and had been getting stone from a quarry again. I asked if there would be a possibility of getting some for us, too. (I don't know why I asked that question, rock is expensive and we've already had more than 500 tons of big stuff hauled in, not including the countless tons we hauled with our little trailer over the years, but we were fresh out of large ones and we had Cody's rock sitting there all forlorn, so what the heck, in for a penny, in for a pound, right?) Charlie said ok. The following week, six loads of big rock arrived. Once again, I had the brilliant idea (Carl wasn't crazy about it) to have three of the loads dumped right on the front lawn where Cody's rock was sitting. This way we wouldn't have to move them from the back eight when it came time for placement. It actually worked out quite well having them dumped there and was very handy, though it looked awful. Just look at how tiny our 'big' tractor looks next to this pile! Yes, we know we are certifiably nuts, but to have rocks to play with again is an indescribably giddy feeling--so many possibilities! Here, our neighbor stopped by to ask Joel if we were crazy, too. It's a good thing my father wasn't alive to see this, he'd have a fit. Rocks and farming don't go well together. So, we had another 120 tons of big rocks, all the plants moved out and all that remained now was for the heating contractor to come and put in the geothermal. We had a hard time waiting the few days; we wanted to get started on the renovation of the west side of the house right away, especially with the new stone. But we waited. The geothermal installation will be the topic of my next posting, stay tuned! The Calendar Says April, right?